We have 12 comfortably furnished cabins. 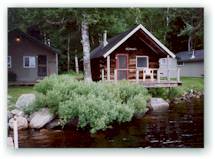 Six are housekeeping cabins and six are smaller log cabins, most of which are situated just a few steps from the lake. 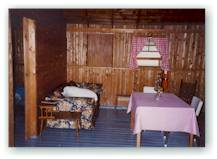 All cabins are heated with wood or propane and come fully supplied with fresh linens, towels and soaps. Most of the housekeeping cabins have a full bath with shower and two bedrooms which sleep up to six people. The kitchens are fully equipped with gas cook stove, gas refrigerator, dishes, pots, pans and utensils. The smaller log cabins, some dating back to the 1880s, have no facilities and use a centrally located bathhouse. These cabins can accommodate two people. All cabins are equipped with propane and electric lighting. The generator runs at scheduled times during the day and is shut down in the evening. We do have a cellular phone for emergency use, but cell phone connectivity is limited.